Here are some solid tank picks for passive scouting. Though Matchmaking has recently undergone some changes, scouting in World of Tanks (including passive scouting) is still a viable strategy that a lot of players enjoy. Passive Scouting requires players to, more often than not, remain completely still in order to take advantage of specific equipment, all in the name of increasing the View Range in order to spot enemies. To succeed at Passive Scouting, you will first need to know how to scout in World of Tanks. After that, you'll be wanting a tank. The most important thing when selecting a Passive Scout Tank is that it needs to have a high View Range and incredible Camouflage ratings, as this helps you see far and remain undetected. Although these tanks may not be some of the best tanks to farm credits in World of Tanks, they offer their own kind of reward through successful spotting. While we haven’t included all Passive Scouting Tanks, below are some of the best. If you think we’ve missed one that absolutely belongs on this list, let us know and we might just add it and give you a shout out! The M5A1 Stuart, though its View Range isn't as good as it could be, is still a good passive scout. Starting Tier 4 is the Chinese M5A1 Light tank. While Tier 4 matches are almost as bad as the black hole that is Tier 3, the M5A1 Stuart, with its ability to effectively scout, alleviates a lot of the stress. Unfortunately, not every passive scout can be perfect, and the M5A1 Stuart suffers from a slightly lower View Range than desired. However, with a compact design and decent camouflage values, it can remain hidden and even sneak up close to an enemy base and provide anti-SPG support. 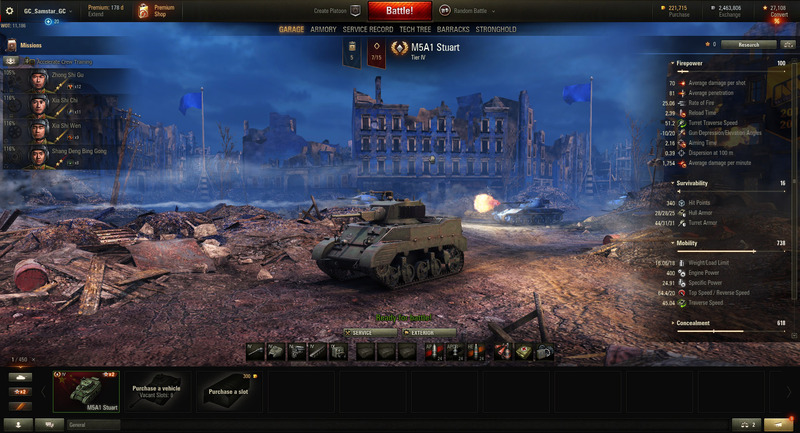 The M5A1 Stuart also offers excellent acceleration, allowing it to move quickly in a moment’s notice. This take-off speed will allow you to quickly relocate. In the event you're sitting in a bush and spotting, consider turning your hull in the direction you plan to escape, that way you don’t have to rely on the Stuart’s maneuverability, which is subpar. Even with its flaws, when supplemented with Equipment, the Stuart is a passive tank worth keeping, especially if you require practice in lower tiers before progressing.